fferent types of auxiliary devices such as reservoirs, filters, accumulators, and piping have also been described in this book. Topics on hydrostatic transmission, cartridge valves, load sensing pump controls, fluids, filters, and seals are given in detail. Design, installation, and maintenance aspects of hydraulic systems are added to make the book more useful to actual practitioners of these systems. Understanding the fundamental laws and principles allows the reader to use basic theoretical concepts in practical applications. The unique feature of this textbook is that all quantities are given in the SI system as well as in the English system of units. This book provides an extensive coverage of fluid power to designers, engineers, technicians, and students of engineering colleges, polytechnics, and vocational training institutes. This book, prepared especially with an academic interest in mind, contains a large number of numerical examples, design problems, and sections for ‘Test your Knowledge’ and end of chapter questions. 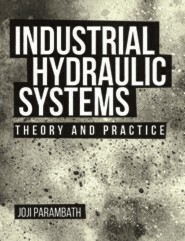 This book is intended to provide the most current information available on hydraulic technology. Joji Parambath has acquired his Master Degree in Computer Applications. The author is a retired Joint Director from the Directorate General of Training under the Ministry of Skill Development and Entrepreneurship, Government of India. The author is now pursuing his career as a Trainer and Consultant in the area of fluid power. The author has many years of experience in training students and faculty members from engineering colleges, polytechnics, and vocational training institutes, and professionals and technicians from industries in the field of fluid power and automation.